We tipped you off about Daisy, the cutest kitten in the world, and we introduced you to Champ, the happiest dog on earth. Now, it’s time to call your attention to one very unfortunate owl. 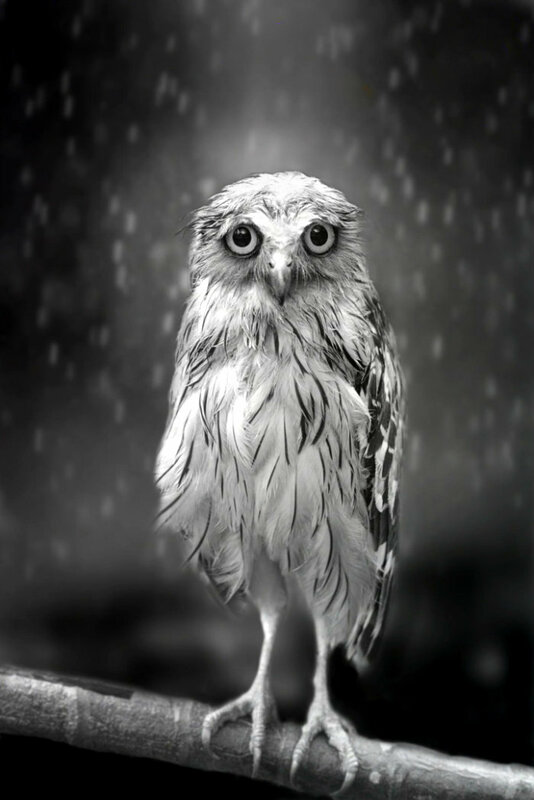 Drenched in rain, he’s got to be the saddest looking owl we’ve ever seen. Photographer Shamma Esoof shot this bird at Penang Bird Park in Malaysia one rainy monsoon day. As she stood in rainwater, that was ankle deep, she shared a special moment with this shivering wet owl. “We stared at each other for a long while,” she told us. “Its deep intelligent eyes and sad demeanor changed my perception of birds forever. The photo was uploaded onto 500px and then went viral. Not only did it get picked up by print and online magazines, it was awarded several prizes including the Grand Prize in the “Capture the Moment” competition by Duggal Visual Solutions. 500px recently wrote an article about her shot called Sham’s Story: How a Sad Looking Owl Made for a Very Happy Photographer. via The Saddest Looking Owl in the World – My Modern Met. This entry was posted in PHOTOGRAPHY and tagged Owls, Popular. Bookmark the permalink. ← Bread in the Middle Ages. He does look very sad. I’m sure the Owl cheered up. I would like to think so.